Waikiki Snorkeling: Best spot to snorkel in Waikiki :: oahu hawaii. queens beach. If you’re staying at a hotel or resort right on Waikiki Beach, one of the best places to go swimming in Waikiki is right in from of your hotel! 😉 Nothing beats ease and convenience! 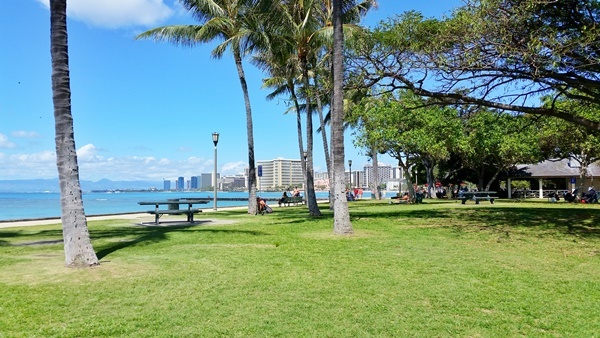 But if you want to explore Waikiki beaches a little further, head on over to Queen’s Beach! It’s basically on the far end of Waikiki away from Honolulu which means you’ll usually find less people too. There’s a map below that you can explore to look into the location of this Waikiki beach. Or, if you just can’t wait 😉 have a look at the Oahu map here! And as with all beaches in Waikiki… snorkeling here is free! 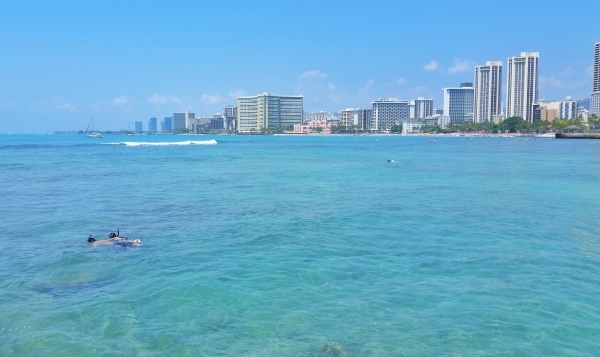 Here are a few reasons that make this Waikiki beach a place to consider for snorkeling in Waikiki! 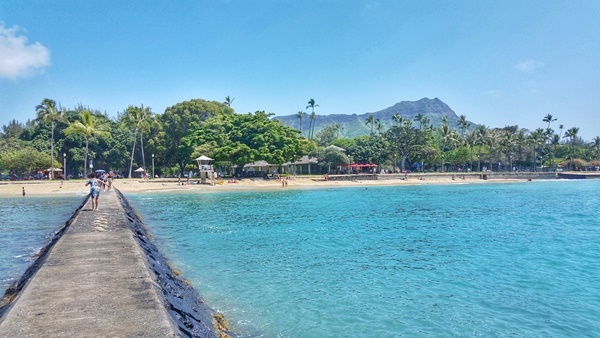 By heading to this area of Waikiki, you’ll be snorkeling in the Waikiki marine life conservation district. The state of Hawaii has protected areas throughout the Hawaiian islands. These are called Marine Life Conservation Districts, and there are such districts off the beaches of Oahu, Maui, and the Big Island. On Oahu, there are 3 of these marine life conservation districts, and snorkeling at Queen’s Beach will place you in a district that’s located in the Waikiki stretch. You can have a look here at the map to see further what parts of Waikiki are considered to be protected waters for marine life. The other 2 districts in Oahu are Hanauma Bay and Shark’s Cove. Since Queen’s Beach is located on the far end of Waikiki, this means that when you’re in the water here, you get the iconic view of the Waikiki oceanfront when you’re not snorkeling underwater looking for fish and sea turtles and when your head is above water! One of the most prominent buildings you’ll see is the pink building, and that’s the Royal Hawaiian. And if you’re far enough out in the water when you’re snorkeling, when you look behind you, you’ll get the iconic view of the famous Diamond Head Crater too! The Diamond Head Trail is one of the most popular hiking trails in Oahu. You may consider doing the Diamond Head hike in the morning, and then getting in the Waikiki snorkeling in the afternoon! Sounds like a perfect day of things to do near Waikiki! On the land side of Queen’s Beach is Sans Souci Beach Park. Once you’ve finished up your snorkeling adventures, the park that overlooks the beach and the ocean is a perfect spot to refuel yourself with food! You can pack some snacks or a meal so you can have a picnic lunch at the park. Or, there’s also a snack bar here so you don’t have to bother packing that food! 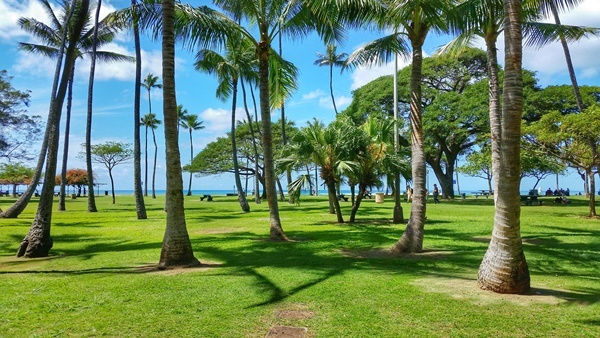 Since it’s on the outskirts of Waikiki away from the crowds, Sans Souci Beach Park can be a popular spot for locals to choose to hang out at the beach and park. If you’re lucky, there will be a Hawaiian or two there hanging out with their family while playing the ukulele! How’s that for some Hawaiian music at the park! An easy reference point to start snorkeling is to look for lifeguard station 2F. It’s around this area that the Waikiki Marine Conservation District is located. And it’s never a bad idea to check in with the lifeguard and ask about the snorkeling conditions and if there’s any specific risk of rip currents you need to watch out for! When is the greatest threat for jellyfish stings in Waikiki? There can be an influx of jellyfish seen in Waikiki on a monthly basis. As explained here, the timing of the visits of more jellyfish to Waikiki can generally be predicted. Scientists currently believe that this happens because when high tides happen at night, the jellyfish are able to cross over the coral reefs onto the beach side. But when the tides get lower in the morning, the jellyfish essentially get trapped, unable to get to the other side of the coral reef out to sea because of the low water level. This results in more jellyfish than usual on Waikiki Beach. Read more about it. So is there a greater chance for jellyfish sightings when you’re in Waikiki?! 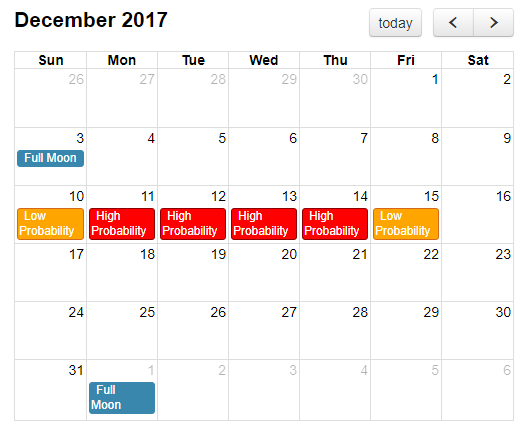 Because scientists believe that the influx of jellyfish has to do with tides, the current predictor is based on when the full moon is and when these tides happen. The greatest risk for jellyfish stings in Waikiki tends to be 8-12 days after a full moon. 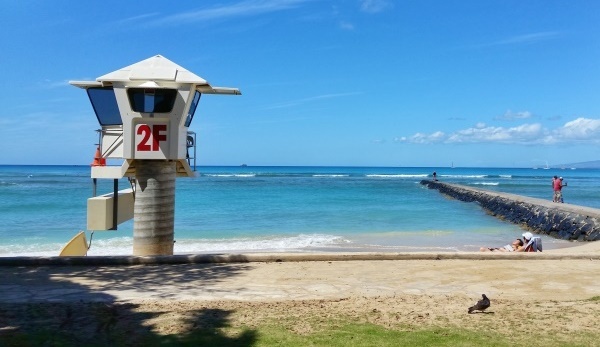 Take a look here so you can find the month you’ll be in Waikiki to see if you’ll need to be extra worried about jellyfish stings when you’re planning your Waikiki snorkeling activities. This doesn’t mean that there will be no jellyfish sightings outside of these times, but during this time period is when there’s a greater risk for tons of jellyfish. And if your stay in Waikiki will coincide with the potential for an increase of jellyfish on Waikiki Beach, then you may also consider reading up on what to do if you or someone in your family experiences a jellyfish sting when snorkeling in Waikiki. There are lifeguards across Waikiki Beach, and they can also help with this. Depending on where you’re located in Waikiki and how much beach and snorkeling gear you’ll be carrying, the best option could be to simply walk! The Duke Kahanamoku Statue (right near where the free Waikiki hula show takes place!) is a pretty central Waikiki location. From there, it’s about a 15-20 minute walk. Have a look at the Oahu map for better reference. If you’re carrying more snorkeling gear than you’d like to walk with, or if you’re staying at the far opposite end of Waikiki near the Hilton Hawaiian Village, the bus is another easy and convenient option to get to Queen’s Beach. Have a look at the bus directions here for the Hilton Hawaiian Village to Queen’s Beach as an example. It’s about 15 minutes by bus from one end of Waikiki to the other end. In the Waikiki area, the bus is relatively frequent, coming every 10 minutes or so. Using the Google Maps public transit option is the easiest way to navigate the bus system on Oahu, and it’s pretty reliable. The Oahu bus will cost you $2.50 per person. No change is provided, so be sure to have exact change! Here are more tips for taking the bus on Oahu. 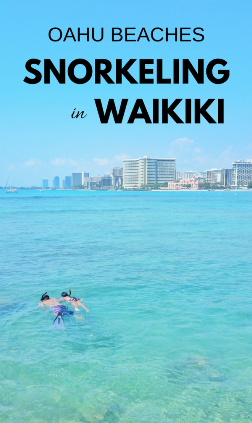 You’ll end up parking near the Waikiki Aquarium, so if you want to check that out, you can conveniently check it out before or after you snorkel! Of course this is an option if you walk or take the bus too, but consider that you’ll be carrying your snorkeling gear with you in the aquarium. If you drive, you can leave your stuff in your car which can make it easier. Tickets are $12 for adults and $5 for kids. Learn more here about the Waikiki Aquarium. Now, here are some things you just may want to consider adding to your Hawaii packing list so you’re ready for the sun when you’re snorkeling in Waikiki! This personal buoy or this flotation snorkel vest so your family on the beach can spot you out in the water in an instant! These types of UV protection shirts to wear so you don’t burn under the strong tropical sun rays when you’re in the water! If you’re on a desktop, use the far left column to filter by women, men, girls, or boys! Look at these types of swim shorts too, for women and men! For a more in-depth look at what to bring snorkeling in Waikiki, have a look at what to wear snorkeling!